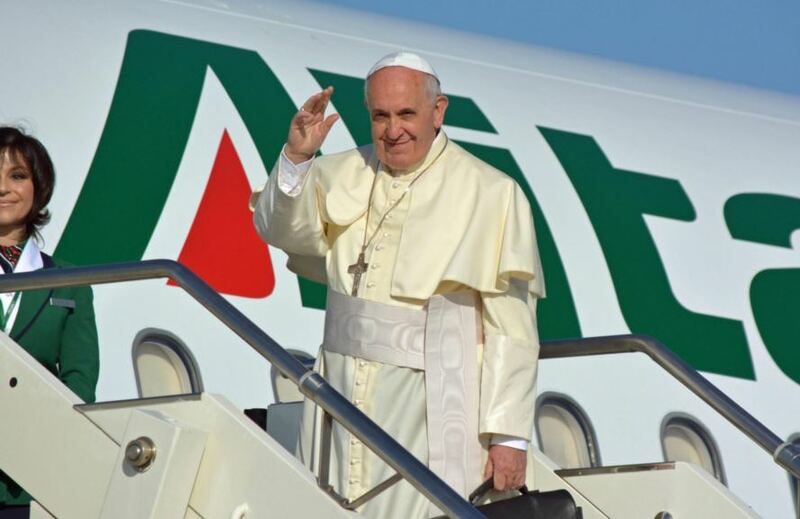 Jeovany Jimenez Vega, 27 September 2015 — The recently concluded visit of Pope Francis left Cuba awash in a wave of controversy. To the amazement of some and the disappointment of others, a pope known for being direct, almost penetrating, in his incendiary statements to the centers of world power, and who has shown courage in opening a Pandora’s box inside his own institution, to the delight of many enjoying the show, was nevertheless too cautious in facing the Cuban dictators. From someone who has taken steps considered truly reckless in contrast to the millennial conservatism of his Church, who arrived in Havana preceded by his reputation as a radical reformer, and whose statements on behalf of the dispossessed have even earned him the absurd accusation of being communist, many expected a bolder more direct speech against those responsible for the well-known disregard of human rights on the island. But such disappointment may have originated from an incorrect assessment of the exact coordinates of his passage through Havana, the uncharted context in which his visit occurs: it happens that the country visited today by the Argentine Pope is not the same one visited by Wojtyla in 1998; nor even the same one visited by Ratzinger in 2012. Just because the dictatorship is exactly the same doesn’t mean that Cuba is. The political audacity of Obama in diametrically reversing a policy perpetuated by his nine predecessors in the White House is not the focus of this discussion, but the consequences of this shift are undoubtedly far-reaching. This has obviously affected the political scene inside and outside of Cuba because in the short term it has conditioned a different attitude toward the island and has raised more expectations in the entrepreneurial sector of the informal Cuban economy. Because a country is the sum of the needs and aspirations of the people who inhabit it, something well-known to Bergoglio, an expert on human nature, he must have opted for prudence out of the conviction that it was the appropriate thing right now. Let’s put everything in context. Bergoglio is a Pope who has publicly agreed to mediate one of the longest and most bitter conflicts in modern history, and therefore follows the golden rule of all mediators: do not embarrass any party taking a neutral position. He knows that the world is watching his every gesture. He also knows the penchant of the Cuban side to concoct absurd pretexts, and he knows that any confrontational statement could cool the climate of the current negotiations. At this time the pope is a political actor and conducts himself as such. In Cuba we saw a Bergoglio focused on his purpose of bringing the two parties closer to try to resolve a longtime dispute. We are in the presence a man in the prime of his personal maturity and at the summit of his life’s work, conscientiously serving in a delicate negotiation. Like any good politician, who never sacrifices the final objective for intermediate skirmishes, he simply puts his mission ahead of any personal opinion he may have on the matter and keeps his attention fixed on achieving the goal. Nevertheless, his personal visit to Fidel Castro was disconcerting—he was not required by protocol to visit someone who at this point does not occupy any official positions. If instead he had not visited Fidel’s home, he would have sent a clear political message about his desire to break with a past that Cuba urgently needs to leave behind. But for either practical or purely personal reasons he chose to give a media selfie to the dictatorship. Seeing him with the man who has most damaged the Cuban nation has been deeply disturbing, but time will unveil the true intention of his encounter and only then will we know how ethically justified his decision was. Controversies have also arisen about his later statements denying knowledge of the arrests of hundreds of Cuban dissidents during his stay on the island. But not meeting with any dissidents fit pragmatically with his objective when seen from the viewpoint of a mediator: this would have unduly strained the climate of the visit, in the view of the Cuban government—and is something, by the way, that was not required given the essentially pastoral character of his tour. Viewing everything in this light, it was simply a diplomatic matter of refraining from making inflammatory statements. But all this made more evident still the dilemma of the Cuban Catholic Church; caught between the brittle pride of a suspicious dictatorship and hurting those who are supposed to be its people has presented a profound ethical dilemma. We are facing a new scenario in which age-old questions are repeated: what is the role of the Catholic Church, located between a suffering people and the despotism of their oppressors? Where is her exact place in this puzzle of contradictions? To what extent should the successor of Peter be politically involved? Or maybe the question is much simpler still—Which side would Jesus be on at this crossroads of our history? At this time Francis, who delivered a speech to the UN General Assembly in keeping with his style, has opted not to take a risk regarding Cuba, has decided to dance to the rhythm of his own tango, and from the stairway seemed to sing “goodbye children!” as one who knows all the answers beforehand.